If you wish to explore the exotic experience of travelling the mix Belize / Mexico you should enroll for our 13 days special travel package Belize from/to Cancun. 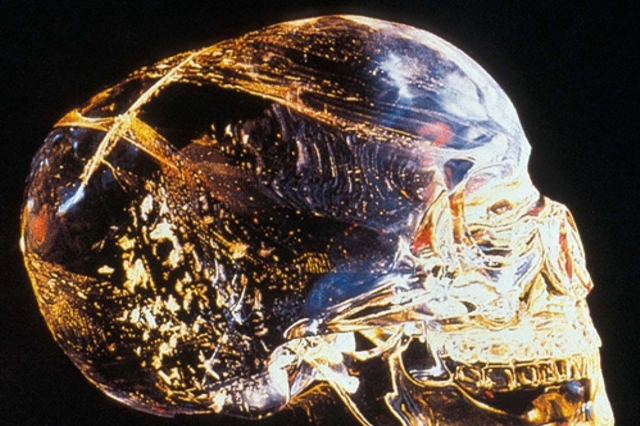 Check it out, it includes everything what is needed to experience a great vacation. Are you looking for an exciting and diversified travel package? A round trip with us brings your vacation to the point! and great adventures without hassle. is opposite – the hotels and the attractions are waiting for you. and well trained English speaking guides. You will see we a mix of ceremonial sites (ruins and caves) and experience different ways in exploring this holy places of the Maya. Beside this you will experience Carribean Sea and georgous nature. Cancun / Playa del Carmen. We welcome you at Cancun International Airport and transfer you to your hotel “Real del Mayab” in Playa del Carmen. 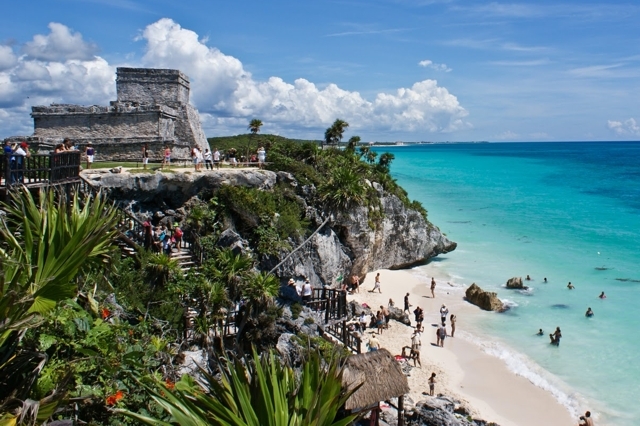 Today we visit the Maya ruins of Tulum on the beach in the Bay of Mexico. Afterwards we enjoy the crystal clear water for a refreshing bath. In the afternoon we drive to Belize. Overnight stay is in “La Fuente” Orange Walk. 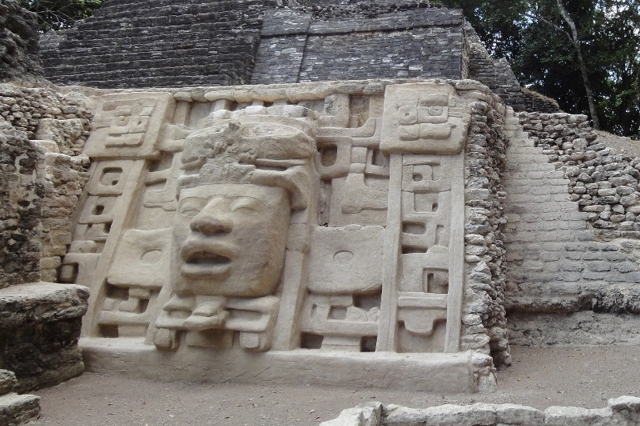 Our trip today leads to one of the most interesting Mayan ruins in Belize – Lamanai. The spectacular route to the Maya site runs by boat along the New River. Crocodiles, monkeys as well as diverse bird species and an incredible variety of plants is the scenery aside the river. In the evening we drive to our hotel The Green Valley Inn in Cayo. After breakfast we visit and explore the secret Maya ceremonial place “Actun Tunichil Muknal”. Hidden in the jungle is ATM certainly one of the main attractions, if not the very attraction of Belize. We swim into the entrance of the cave system. After about 1 mile river walk and climbs over rock formations we arrive in the main hall. Centuries old handicrafts, skulls and skeletons convey impressions of old Maya ceremonial practices. After breakfast we drive down to Placencia to the Caribbean Sea. Clear, warm water, fantastic sandy beach bring us into the Caribbean atmosphere. Enjoy the day, relax, go swim or stroll around. Overnight stay in Sea Spray Guesthouse / Placencia. B) The buildings were built without masonry. Our second stop is in Nim Li Punit (Great Hat.) Nim Li Punit is especially worth seeing because of its unique steles. Afterward we drive back to Placencia for overnight stay. Breakfast, followed by a drive to North West Belize, where we explore the ruins of “Xunantunich” – one of the most important ceremonial sites of the classical period. Xunantunich’s highlight is the towering main pyramid El Castillo (130 feet). 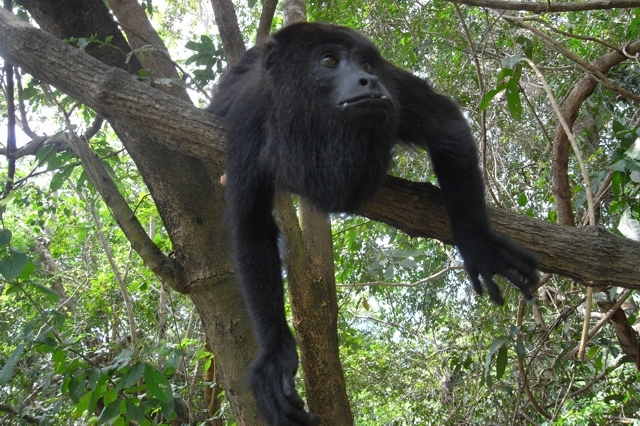 With some luck we will meet Howler Monkeys in the jungle surroundings of the Maya ruins. On the afternoon we drive through a settlement of the conservative Mennonites to the Barton Creek Cave. 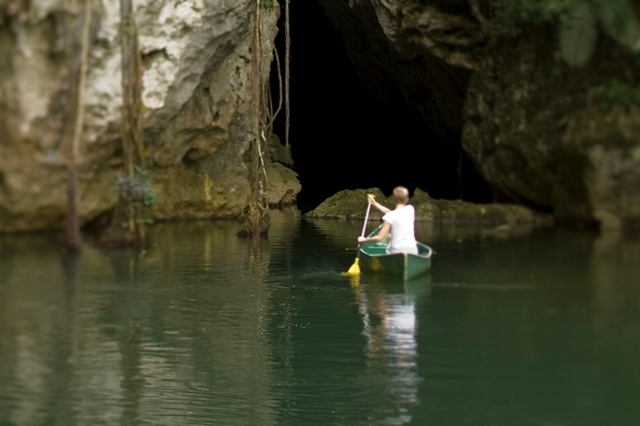 This cave, which we explore in a canoe, the Maya used to sacrifice to the rain god Chaac. It is not yet known that in the dry season today’s guides have tried to surrender tourists to the godes … Overnight stay in The Green Valley Inn. Early in the morning, we leave Belize for Guatemala and head to the most spectacular site of the ancient Maya . We leave Belize in the early morning, cross the border to Guatemala and continue for about 2 hours toward the national park. The ruins are within a 225 square km area and include 5 temples. 3 of them are accessible. After the tour and a late lunch we return to The Green Valley Inn in Belize. Breakfast; afterwards we drive on a really adventurous road through the famous Mountain Pine Ridge to the legendary old Maya city of Caracol in the deep jungle of the Chiquibul National Park. On the way back we explore the impressive Rio Frio Cave before we stop and relax at the spectacular waterfall system Rio on Pools. Overnight in The Green Valley Inn. It’s time for another trip to the Caribbean Sea. 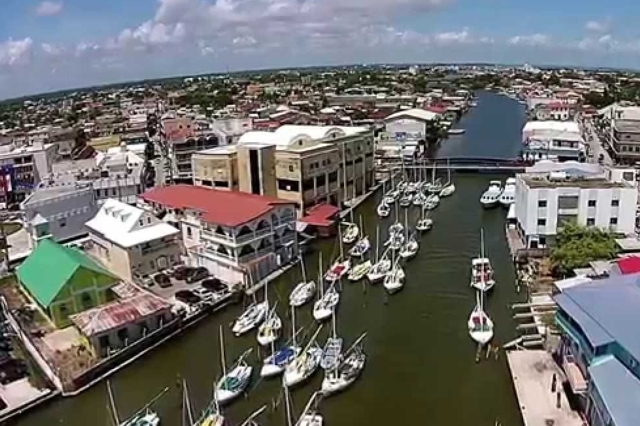 After breakfast, head east to Belize City and then continue by speed boat to the beautiful island Caye Caulker. The afternoon is available for individual enjoyment. Overnight stay at Tree Tops Guesthouse / Caye Caulker. After breakfast we will discover the amazing underwater world of the Caribbean Sea on an exciting snorkeling tour. 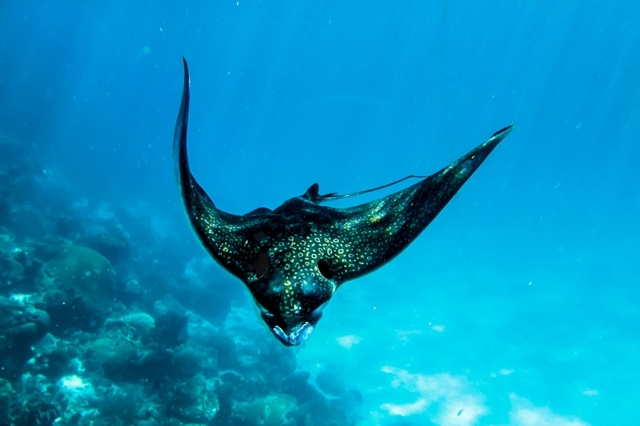 Our boat with an experienced guide brings to 3 great snorkeling places. Overnight stay at Caye Caulker. 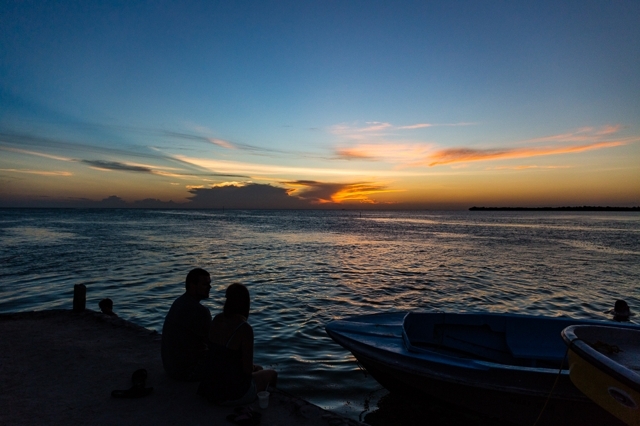 After breakfast, you will be on a last sea adventure during this exciting journey: The spead boat brings you first to San Pedro, then to Corozal. Afterward we cross the border to Mexico. Overnight stay in Bacalar. Unfortunately the adventure is over. Your transfer goes to Cancun airport or any connecting program in Mexico (Tulum, Playa del Carmen or Cancun). Here you can find some of the very exciting and fun moments of the journey at various places in Belize. The gallery let you explore the amount of fun and adventure you are going to experience with tour.